The City of Norfolk is proposing to update our current floodplain regulations. Visit the City of Norfolk website to view a comparison of the existing and proposed ordinance revisions. Posted by Martin Thomas Jr.
Harvey Lindsay Commercial Real Estate said it has been hired by the Episcopal Diocese of Southern Virginia to represent it in the sale of the diocese’s historic Talbot Hall waterfront estate in Norfolk. The 6.4-acre property, which includes 1,000 feet of Lafayette River frontage, is listed for $4.25 million. TowneBank, the out parcel, is going through site plan review with the city and will likely start construction in August. Thanks to Chris Perry for the above update. See Tricia’s full article, with photos, on her website, A little Sugar a little Spice. Where do you want your children to grow up? Somewhere safe? Somewhere that they can ride their bikes to their friends house? Somewhere you can send them out to play and come home when the street lights come on? Where you don’t have to worry about your general safety 24/7? Not here…. Maybe you haven’t heard of Denby Park or Wards Corner. This is our neighborhood. Where we live, work and play. In fear. The city for the last few years has promised to remove the run down section 8 apartments that even the cops hate going into. Vast mazes of blight and trash create a hiding place for crime. They tore down 7. They are tearing down 7 more. However due to budget cut’s we are loosing the war on crime in our wonderful little spot in Norfolk. Or what was once wonderful and could be again. When I took these photos I did not venture far in. It was EARLY in the morning and I was armed with a tazer. You heard right. You don’t go wandering around this area. It was a risk I took with my camera equipment because it needs to be seen. People need to see what the confines of this area are like. I plan to do more as I go. I plan to take shots of the beauty in our little neighborhood also. This photo series will be special too me. I hope it shows that even in the less then wanted areas of the city, beauty can reside. I also wish to show WHY the city should finish their promise to the residents of Ward’s Corner and the surrounding neighborhoods. Read the rest of Tricia’s article, with photos, on her website, A little Sugar a little Spice. The 2013 Greek Festival, Tidewater’s oldest and largest ethnic festival, will include the traditional Greek cuisine, exciting Greek entertainment, arts and crafts, beautiful jewelry, tours of the Cathedral, and the very popular Drive-Thru. Bring the whole family as we share our Greek hospitality with all ages. All proceeds from the festival benefit the Cathedral’s Ministries as well as local community charities. Council Members Barclay Winn, Andy Protogyrou, and Terry Whibley were present. Second Patrol Crime Statistics – A total of 13 crimes were reported in Wards Corner (Planning District 25). An arrest was made in conjunction with a crime reported in March. All 13 crimes reported were larcenies. Three of the four major projects in Wards Corner are near completion. The Titustown Pump Station and the Wards Corner Sanitary Sewer Replacement are scheduled to be completed in spring 2013. The Wards Corner Wastewater Pump Station estimated time of completion is summer 2013. The I-564 Water Main replacement will begin construction spring 2013 with an estimated completion date of spring 2014. Suburban Park Shopping Center — Site prep is underway. The issue of setback of the sidewalk along the Little Creek Road section of the project was discussed. The City will be talking with Suburban Asset Management about an easement along this area so there will be a wider distance between pedestrians and traffic. Midtown Shopping Center — $1.2 million dollars in renovations are complete. Additional parking lot improvements are planned. Lease negotiations are underway. Wards Corner Shopping Center — Negotiations are underway regarding the #1 Chinese Buffet. Dollar Tree is a potential tenant but there are no definitive plans. Farm Fresh — Over a million dollars in upgrades and renovations, including a drive-thru for the Pharmacy was completed. City is in discussion with the property owner about demolishing the former cold storage building for redevelopment. K-Mart – K-Mart will be closing in July. The City has no word yet on future tenant at this site. Suburban Acres Civic League will discuss the issue of double-sided parking at the west end of Suburban Parkway in the area of Norfolk Collegiate Upper School and Suburban and Granby Houses at its May 13 meeting. Traffic congestion in this area makes parking on both sides a safety issue. The civic league will advise Public Works, Traffic Division of its concerns. The issue of the proposed four cent per hundred increase in the City’s real estate property tax was discussed. City Council representatives encouraged residents to come to the City’s public meeting on this issue on May 13, at 6:00 pm at Granby High School. For residents who cannot attend the meeting, the council members invited citizen comments via an e-mail or a telephone call. Photos provided by the Virginian-Pilot. Wards Corner Giant Open Air Market opened in 1963. Photo provided by the Virginian-Pilot. 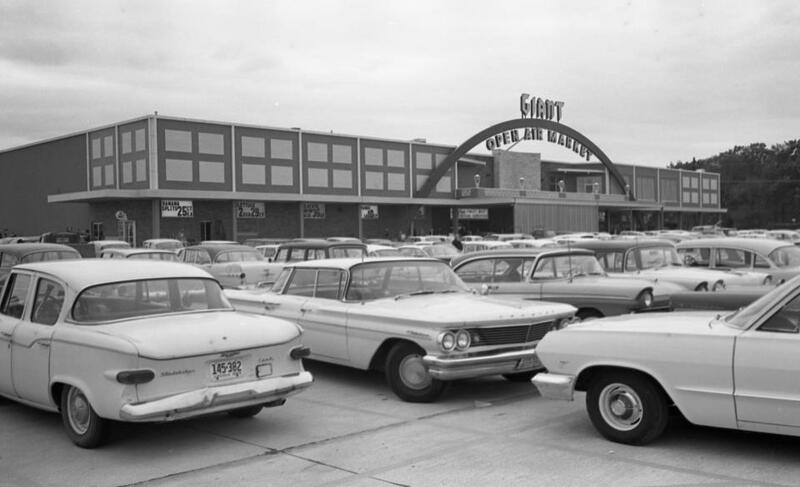 In 1963 Giant Open Air opened its new Wards Corner mercantile center. The 80,00 foot store is the largest retail food store under one roof – at least in the south – and it can boast among many innovations the largest individual departments in several categories. Boasting 450 employees, the supermarket features a pancake shop, doughnut center and pizza ovens for in store consumption or takeout orders. A spacious bakery with eating facilities, largest in the chain, with charcoal cooked steaks, seafood and BBQ. A candle shop, garden shop, greeting cards, household accessories, gift shops, hardware and a self-service Laundromat round out the shoppers experience in this state of the art shopping center. The store was constructed at a cost of $2 million and features 600 customer parking spaces. The store will remain open 24-hours a day. Pilot staff photo by Charlie Meads. Giant Open Air was located where the Farm Fresh is today. The BBQ pit – featuring everything from roast beef to completely cooked pigs. George P. Pearce manager of the Gourmet Foods department. Mr. Pearce is holding a can of Bombay Ducks (lizardfish) and Kangaroo Tail soup. You are currently browsing the Wards Corner Now - Wards Corner, Norfolk, Virginia blog archives for May, 2013.